Light-Up Display Cases are high quality sport display cases that feature a base with colorful lights that illuminate in an alternating pattern. Light-Up Display Cases are powered through a cord plugged into electrical outlet. 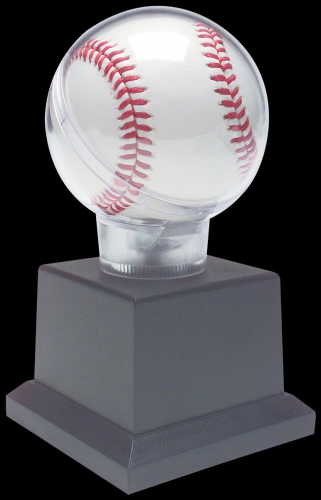 Baseball Display Case, 4 3/8"x 5 3/8"x 7 7/8"
This is a two piece clear acrylic globe attached to a black plastic pedestal style base that has room for personalized plates on each of the four sides. The globe holds a regulation size baseball, and is a great way to protect and display your memento or collectible. This is a two piece clear acrylic globe is attached to a slant front cherry finish base that will hold a personalized plate. The globe fits a regulation sized baseball and is a great way to protect and display a cherished momento or collectible.